← Evolution of the Skrunch! Willy Wonka’s Super Skrunch, that is. Willy Wonka’s Oompas stand as one of my all-time favorite candy treats. I loved them as a kid, and I’ve really enjoyed digging into the history of them as a collector. 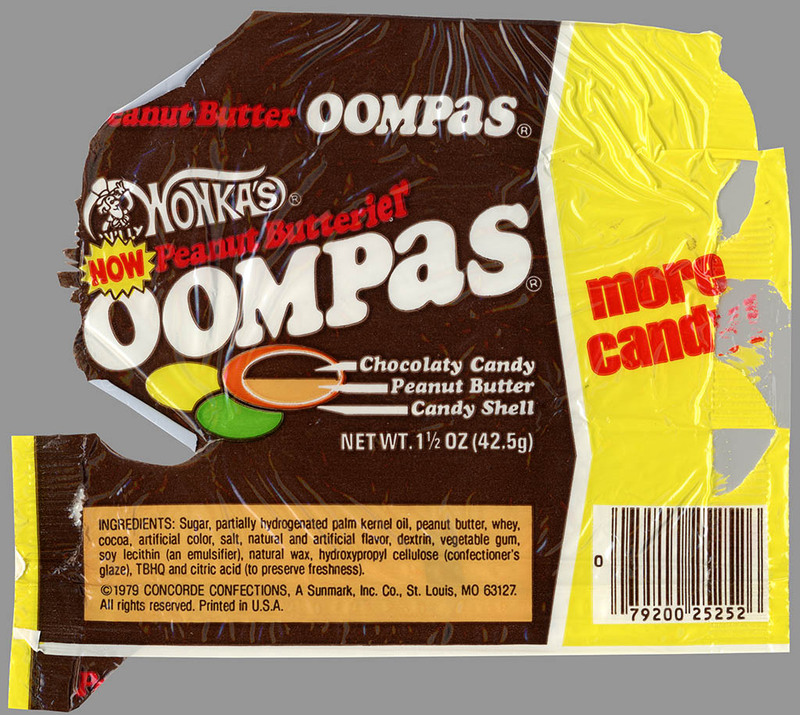 For those who don’t remember, Oompas were like an over-sized M&M candy, but filled with half-chocolate and half-peanut butter. I recall that upon the introduction of Reese’s Pieces in the later 70’s, I was befuddled as they seemed less like pieces of Reese’s than Wonka Oompas, which had been around for years. 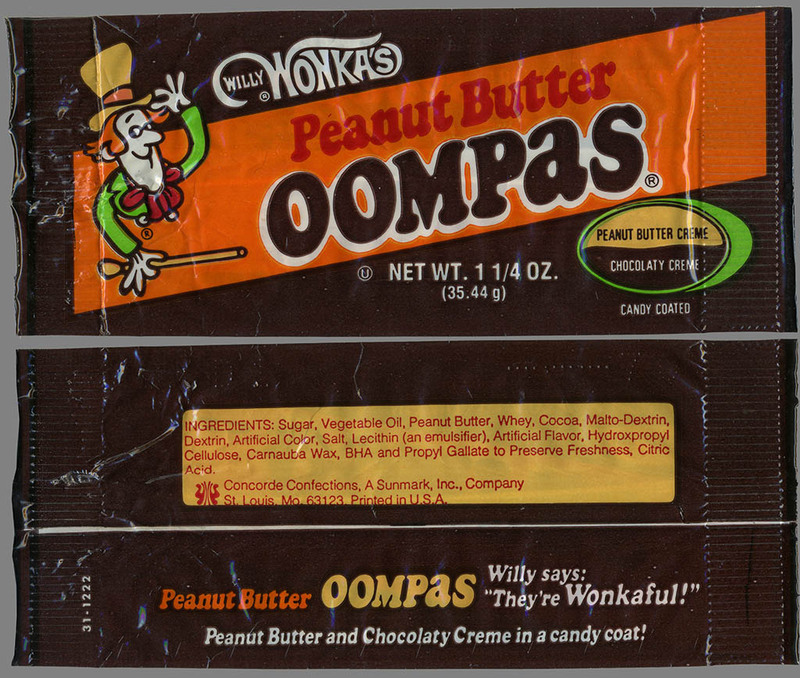 As I pointed out in my teaser post two days ago, the Willy Wonka candy brand was launched in late 1971 with two products; Peanut Butter Oompas and Super Skrunch. 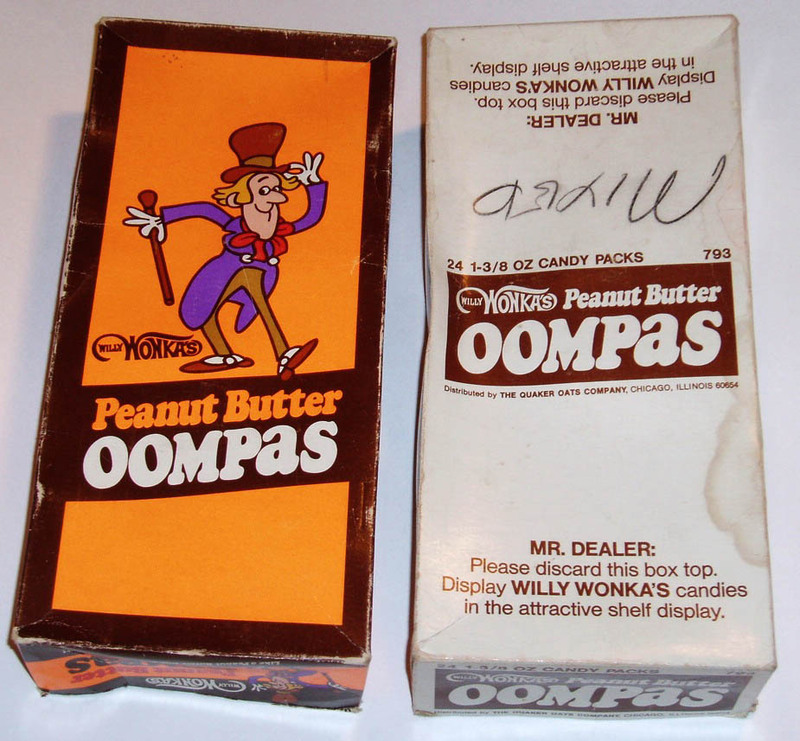 I’d like to point out that I’ve never come across an actual example of an early 70’s “full-body Wonka” Oompas package. I’ve only turned up images from ads and other materials from that period in the evolution of the brand. The earliest example of an actual Oompas pack I can show today comes from my pal Dan Goodsell’s collection. This pack is a style I recall vividly from my own youth. 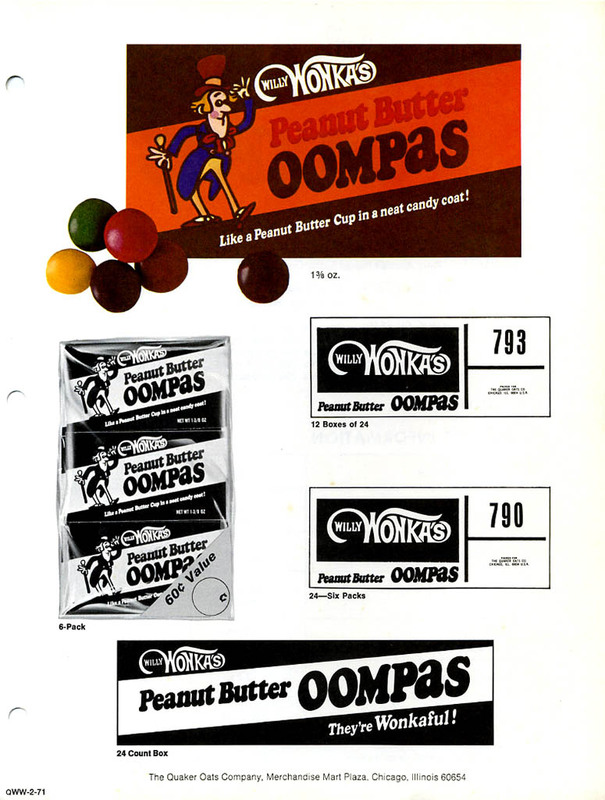 The following year in 1978, Oompas saw the focus put on an adjustment to their flavors, when they became Peanut Butterier. I can’t be sure, but it’s likely that 1980 saw a similar design for Peanut Butter Oompas, but thus far I’ve been unable to track down a standard 1980 package. As was evident during my research of the Super Skrunch brand, the early years of the corporate transition from Concorde Confections to Willy Wonka Brands division was a time of change, and saw the final Oompas offered. 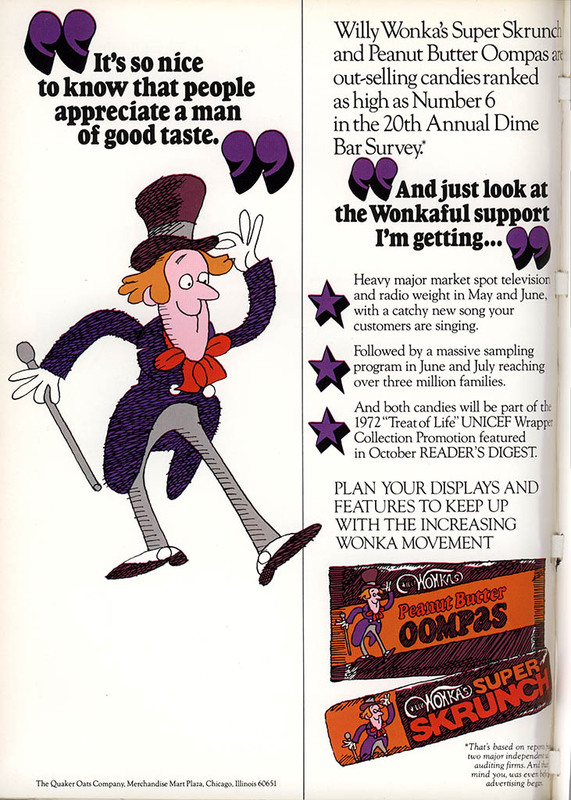 For reasons we can now only speculate on, Willy Wonka’s Oompas were discontinued, likely last on shelves in 1982. None of the new Oompas offerings appears to have lasted very long, and today the world is once again Oompa-less. 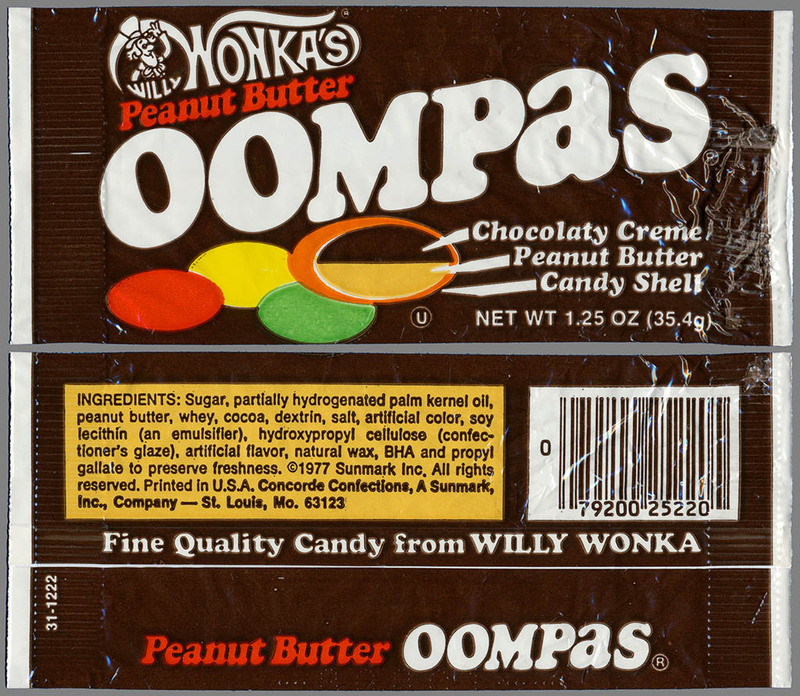 It would be great if the current candy-makers at Wonka could find a way to bring back the original Oompas and Super Skrunch – something they’ve never tried to do. I suspect that production issues might make that difficult or impossible, but I do think a retro release of the original Peanut Butter Oompas would be met with cheers from the streets by many adults who would remember them fondly. So my inner-child continues to dream. I’d like to offer one last whimsical look back at the original treats that started the Wonka candy brand. This is a trade ad that was entirely illustrated, and I quite like the look of it. And that’s everything on this outstanding classic Wonka treat — Oompas. I continue to hope they may one day make a return, but if they don’t, I’ll always remember them with great fondness. This entry was posted in 1970's, 1980's, Chocolate, Nestle, Peanut Butter, Wonka and tagged 1970's candy, 1970's Willy Wonka, 1970's Wonka candy, 70's candy, candy collecting, candy collection, candy collector, candy wrapper collection, candy wrapper collector, collectible, collecting candy, confectionery, confections, packaging, sweets, vintage candy wrapper, Willy Wonka candy, Wonka candy, wrapper. Bookmark the permalink. 26 Responses to Willy Wonka’s Outstanding Oompas! Solid detective work on the early wonka candies. Fantastic read. These were a little before my time but I’m shocked there isn’t anything similar out there today with the half peanut butter half chocolate approach (reeses pieces I would put at a 80/20 pb to choc ratio). Seems like a no brainer. You’ve got to put together a book. I’d buy it in a second. Spectacular post! I think it’s those 1975-1976 wrappers that I remember the most. I do enjoy the current Peanut Butter M&Ms, and seems like those folks could get close to reproducing a candy similar to the original Oompas. BRING BACK THE OOMPA. I loved those things. The ones in the purple package. WOW. Thanks so much for posting. 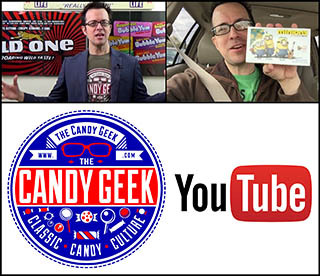 For the last several years I thought maybe I was imagining my favorite childhood candy! I’ve done internet searches & never found info on the chocolate/peanut butter Oopmas in the past but only found info on the chewy/fruity things. (I thought they were called oompa loompas.) YUM!!! LOVE them! I would welcome a return of the original peanut butter Oompa Loompas!! They were my favorite and have great memories of them. What a great story by Jason Liebig, thank you for taking the time to write about the original Oompas! I can’t believe Nestle can’t come up with a business model to manufacture this outstanding candy so that it will become available again. 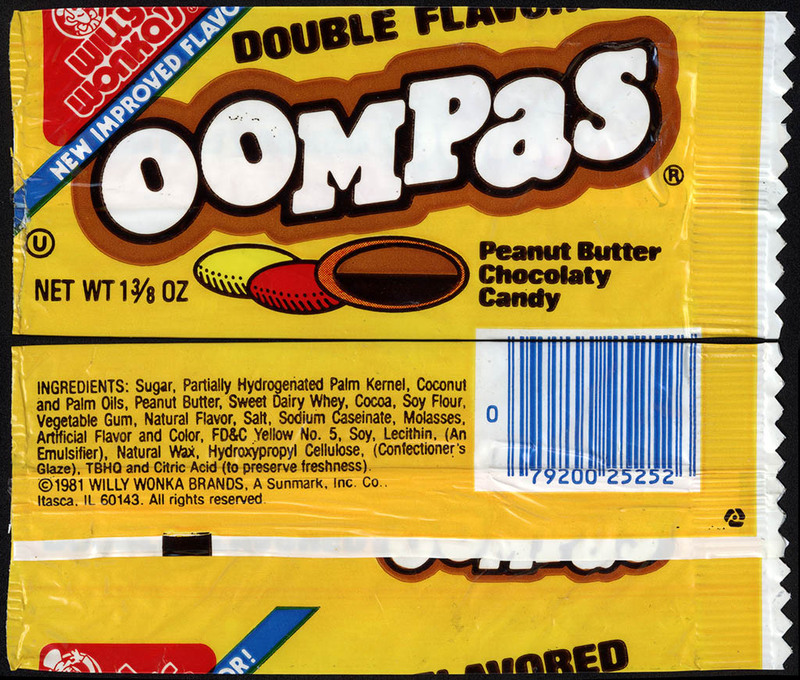 Oompas was wayyy better than M&M’s, of any flavor, and I still remember them to this day, 32 years later. Super Skrunch was good too but Oompas was my favorite. Oompas has great flavor! Some of the execs running these companies couldn’t run a hot dog stand on a street corner in Queens! Ha ha… well, I’m definitely with you on thinking these should be brought back. I’m not holding my breath, but boy it would be cool if they ever did! I worked in a local pharmacy in the mid to late 70’s. This was my favorite candy and one of the best sellers. I too wish they would come back. 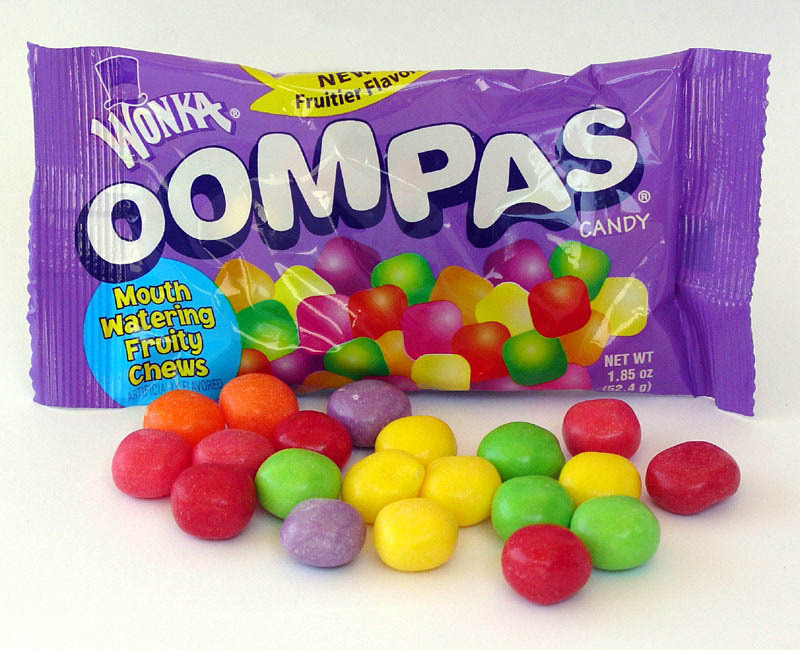 There is nothing on today’s market that taste as good as oompas. Wish they still made them they were my favorite and those nasty reeces pieces can’t hold a candle to the Original Oompas!!! Are you listening Nestle???? 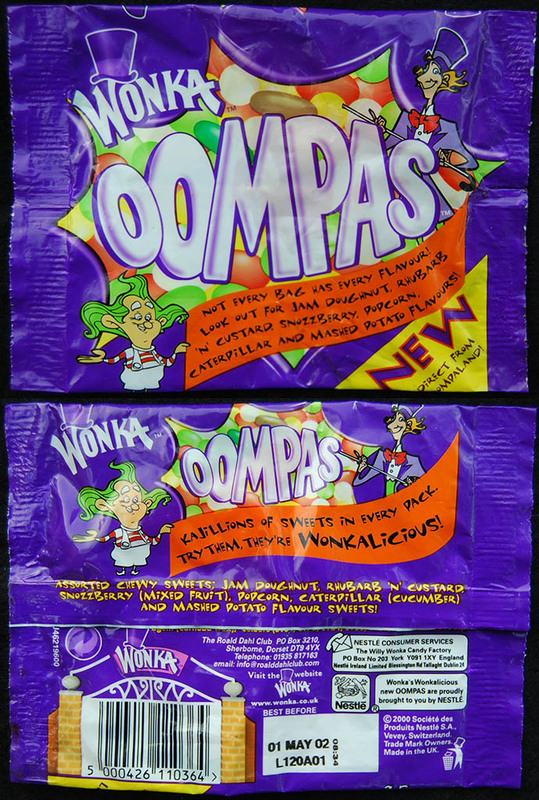 Please bring back the fruity oompas!!!!! The Oompas are still my favorite ever, in all time, my favorite candy. If they ever come back, I will forget everything I’ve learned about healthy eating is quantity controlled! My most favorite candy & I love candy. If they came back I would certainly buy them. I agree with everyone that wants the chocolate/peanut butter Oompas back. I bought them all the time. One of my friends ( I found out loved them also) so I would pick a couple up for him. Then one day, they weren’t for sale anymore. What happened? They were Great! Nothing has ever come close since them. 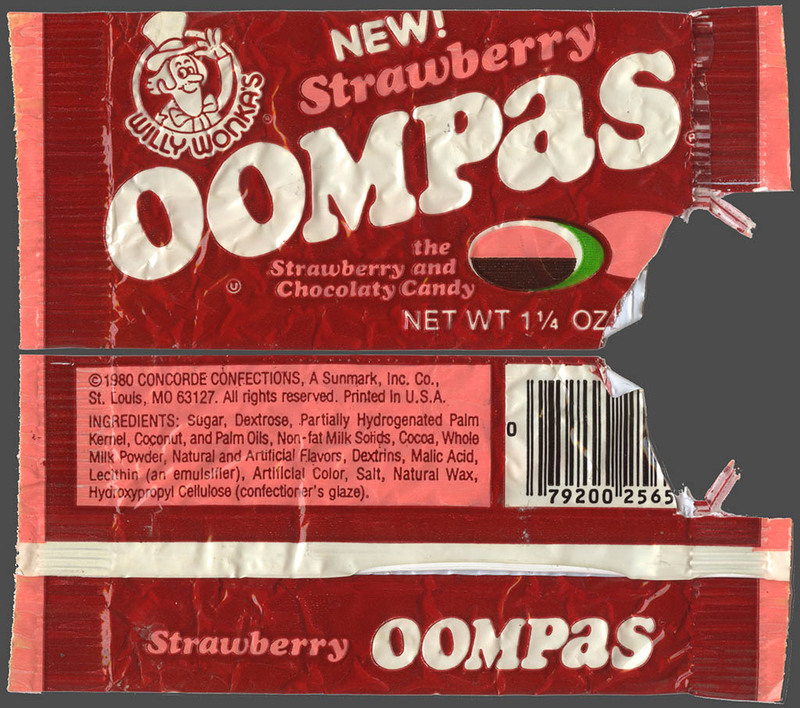 I was reminiscing with my husband about Oompas… To the point where he thought it was just in my imagination… I would love to see this Candy brought back! Oompas were my favorite growing up. Unfortunately I was in a motorcycle accident resulting in some memory loss. About a month ago I started thinking about something being half chocolate and half peanut butter. Then all of a sudden, I remembered oompa-loompas. So I jumped on the internet and search for them. The first thing I saw was a reference to the fruity ones. So I thought I was mistaken. So I did a different search and found the original reference. Then it made more sense. The problem with memory loss is when you recall something is it something you lost that’s coming back or some other reference? My accident was around the same time as the oompas were discontinued. Since then I knew I like chocolate and peanut butter together. At the time Reese’s Peanut Butter Cups were prohibitively priced. The Peanut Butter Cups I found at Walmart we’re pretty good and were purchased on several occasions. I don’t think the accident and the determination to discontinue the oompas had anything to do with each other. I don’t remember if I bought that many packages myself, but I remember now I have them available almost constantly. Reese’s Pieces are good on their own as are M&Ms peanut butter. Although I don’t recommend eating them too close to one another. I ate some Reese’s Pieces the other day and followed them up with some peanut butter M&Ms. Affect of the taste of the two nauseated me to a small extent. So I always remember to eat them separately. My feelings for people who made the decision to discontinue the oompas were the evil Bean counters. They’re the people who seem to want to take over the world from behind the scenes. You see them in every company, and they’re the ones that say we’re not making enough money on that product or service, and decide to discontinue it. And fortunately some companies decide that the bean counters were wrong. The bean counters are probably the extra nerdy little suckers that even us nerdy people picked on. So in Revenge they find things we like and discontinued them. I’m just pleased that there are so many people who remember the original oompas. I’m glad that it wasn’t a false recollection. I also played with making my own candies for a while and still do on occasion. My favorite combinations were mostly chocolate and peanut butter. I remember the original oompas very fondly and I’m saddened that I couldn’t find them. The candies I made where not hard candy coated but it would be interesting to see how closely my recipe came to the oompas recipe. I saw I’m sorry that this post was so long-winded. For all those people who have people who think they’re crazy because they remember oompas, I remember them to but don’t expect to have that used as a barometer for my sanity. Then again, I don’t except a label of crazy from anyone who works in the area of some of the highest suicide rates like doctors. So keep hollering app Nestle’s to bring back the peanut butter oompas. Hopefully they’ll fire the Bean Counter and bring oompas back. With all the internet sources of goodies I’m surprised that someone somewhere didn’t get in touch with Nestle’s offering to be an online source for them. If I have an online business I do it myself. Hell, if Nestle’s would bring them back I start my own online business to distribute them. Assuming that I did not eat all my profits. A friend and I loved the oompass! Can you still get them anywhere? Some companies have something like it but they’re not the same. Let me know if I can buy them any place. Are these still around? Are they ever going to bring them back and put them on shelves? I hope so because they are wonderful! Discontinued about 35 years ago, I’m afraid.